.965 Eyepieces: Who is still using them? Showcase them here! They're not fully operational yet -- need cleaning between elements, but these are so small, I'm in no hurry to risk losing them. Edited by Bomber Bob, 08 November 2018 - 09:51 PM. Eye relief= what you get after taking your eye away from a very short focal length ortho and heading in for a snack. Ear Relief= what you need after your significant other finds out what you paid for that old ortho!! I've got a handful of .965 stuff for use with the 80mm f15 refractor, and the little 50mm Vixen finderscope for the C8. They are mostly the older kellners, and one ortho I think. I like 'em just fine on the Towa for lunar and planetary.... pretty nice! Haven't had that scope out 'ole scope out in a month or two, so I will remind myself to grab the "small eyepiece box" and get a few pics for you folks. Only problem with the .96 ep's seems to be that some sets are pretty obscure or rare, so it makes it that much more difficult finding them on the used market. Yep, the used market is all we have..... it took me a couple of years to build up my modest collection..... and I guess there's not enough demand for a maker to build more true .965's - not re-barreled 1.25's, which seem to come and go on the retail market. It's only natural, that once it's become fashionable to own something that is no longer in production, the highest quality models gets snapped up by collectors first and as the late-comers try to catch up, they will drive prices upwards. 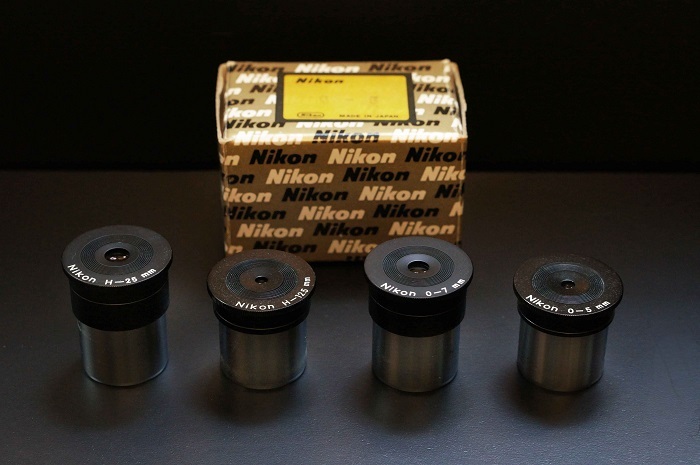 So if you're trying to assemble a collection of Zeiss orthos for your Telementor or a collection of Nikons for your 65mm Nikon, be prepared to pay more for them than for the scope..! And there's probably some that I've forgotten or don't yet know about. 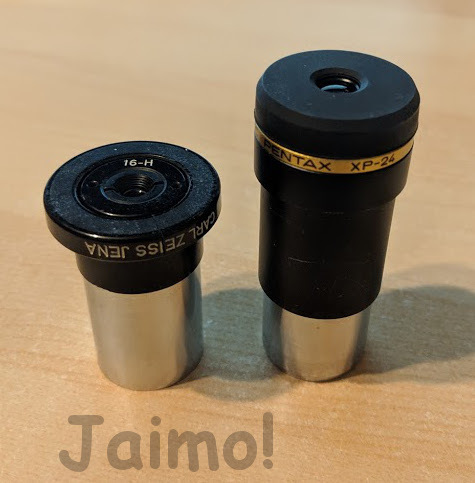 As you can see, there's no problem getting a quality eyepiece that fits a 0.965" focuser, as long as you don't require it to be of a certain brand and vintage. Thanks for the link, Thomas. My 1980s Meade Series 2 Orthos are really just the 1.25" versions with the .965" collar attached. IIRC, the collar fit all of my vintage Tani volcano-tops, regardless of brand; and, some Meade Research Grade eyepieces, and Celestron-branded, too. Be careful with the latter -- seemed the threads were a hair tighter than the Tani -- could damage the eyepiece. Schweet!! Again, a class act. My Goto set is all Huygens -- no Orthos. 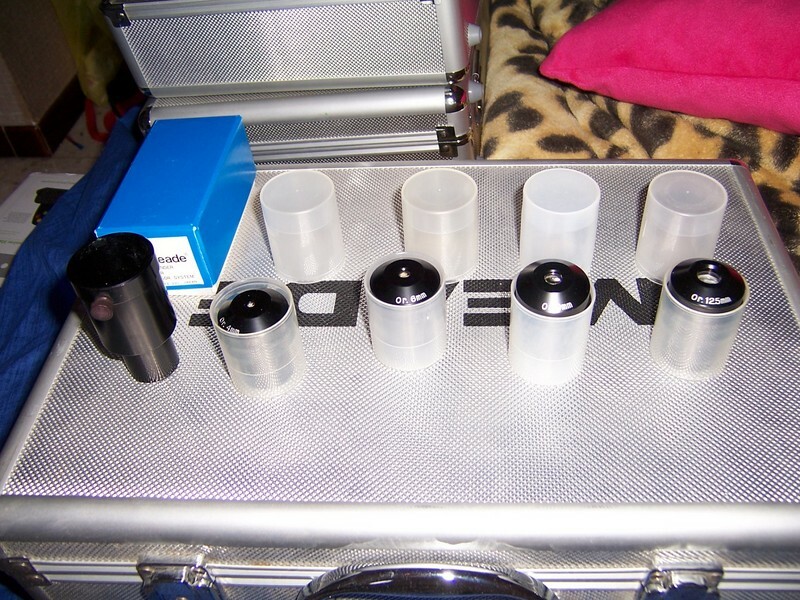 Like Terra I have some Jena Orthos and they are reliable, like reference optics. Where I couldn’t even use high power sears optics the zeiss performed! Here's a gimish of Celestron Kellners and Orthos, made by Vixen and Tani. If I recall correctly the Vixen "Orthos" are actually symmetricals and not Abbes. 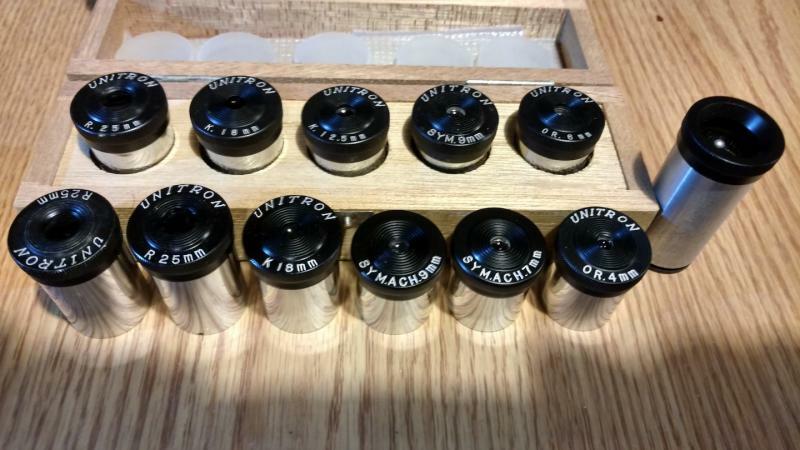 Here's the last of interesting 0.965" eyepieces I currently have... I have my eye out for a couple more. Was not aware that Celestron orthos were not Abbes. Remember, Orthoscopic describes a distortion free eyepiece, the Celestron marketing team may have implied Abbes but we now recognize them as Plossls. We have seen the same thing with the Meade Research Grade "Erfles" which are really Konigs. I may have to take the Tani apart and see what is inside of that Ortho... 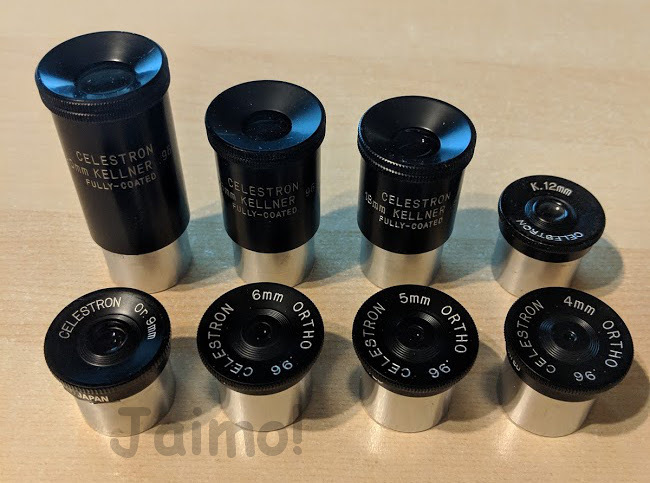 I have also heard rumors that the Meade Series II Orthos are also symmetrical, but I have not yet taken one apart, I guess ignorance is bliss. Thanks for the eyepiece teardown! Sorry, no pix, but I have a pair of 16mm ortho and 25 Huygens CZJs. I also have some old .965"s. With my achromatic refractors I really came to love using the better Huygens or H.M. ones for watching the Moon and planets – trouble is you never know if an eyepiece is good or not, cause there are so many really inferior H.M.s out there as well! Zeiss Jena 0.965” Orthos, Unitron 0.965” Orthos, Circle T 0.965” Orthos. The yellow color-coded 20mm Sears 0.965” Kellner is also quite good. 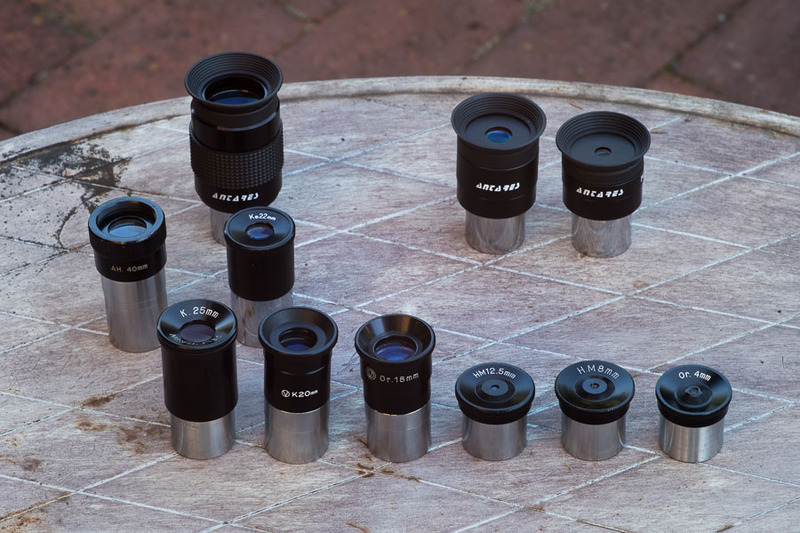 Many Zeiss microscope eyepieces are Abbe design. 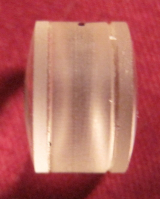 Here's one (the eye lens is still in the holder, but not shown here). Anyway to put this Firewire Camera to use in astronomy? Tele Vue Blog: Does it spark joy?